Emma Ehrhardt wrote: Pick a domain, send them to Louw & Nida to get the relevant vocabulary, then have them check relatively frequency of the terms, and let them have at creating the picture books using open-licensed images from the web. There are two issues with this approach. L&N is great, but lacks collocational information on what to sensibly do with the vocabulary. To some degree that can be gleaned from LSJ, or other dictionaries with examples cited. Second is dumbing down the Greek. 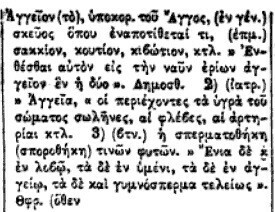 χύτρα is classical, but not in the NT vocabulary, and is used in the Modern idiom as a casserole pot, but is cognate anyway with this group. 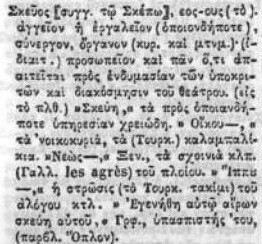 δοχεῖον is described by Caruso simply as "ἀγγεῖον", with the suggestion to look up the verb too. 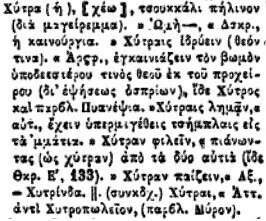 Byzantinou says it is a μέρος in the sense of an ἀγγεῖον with some qualifications added ("which receives something within it"). Δοχεῖον (τὸ). μέρος (ἀγγεῖον) τὸ ὁπ. δέχεταί τι ἐντὸς αὐτοῦ. Point being, just using L&N and frequencies, may not be enough to be enough to dumb down the Greek for picture books. Finding the exact term for something is a different line of inquiry, and is actually a bit easier than finding a generic word for a concept. Presumably picture books need to be written in as simple as possible Greek. That means understanding the meaning structures between words, not only their cognate groupings. That is the end of the second point that I wanted to raise. Here is a list of words I've added to my "Container" wordlist. Not all container words are listed, but most of these are NT words or subject relevant. Louis L Sorenson wrote: Here is a list of words I've added to my "Container" wordlist. Not all container words are listed, but most of these are NT words or subject relevant. I love these lists where you gather together under a collective English noun a whole series of related Greek terms with different applications and different nuances. So helpful when doing composition. Thank you.